October 20, 2015 – According to a new theoretical study, when our solar system was born 4.6 billion years ago only eight percent of the potentially habitable planets that will ever form in the universe existed. And, the party won’t be over when the sun burns out in another 6 billion years. The bulk of those planets – 92 percent – have yet to be born. This conclusion is based on an assessment of data collected by NASA’s Hubble Space Telescope and the prolific planet-hunting Kepler space observatory. Looking far away and far back in time, Hubble has given astronomers a “family album” of galaxy observations that chronicle the universe’s star formation history as galaxies grew. The data show that the universe was making stars at a fast rate 10 billion years ago, but the fraction of the universe’s hydrogen and helium gas that was involved was very low. Today, star birth is happening at a much slower rate than long ago, but there is so much leftover gas available that the universe will keep cooking up stars and planets for a very long time to come. 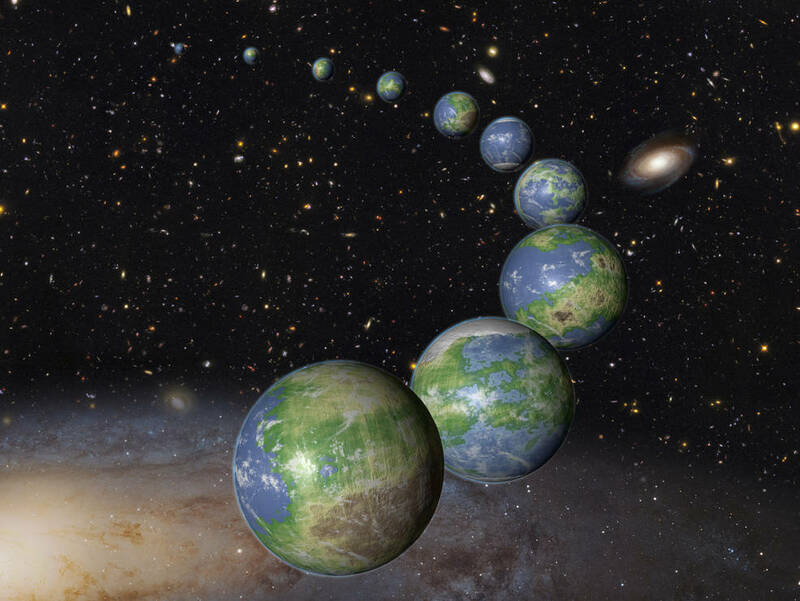 Kepler’s planet survey indicates that Earth-sized planets in a star’s habitable zone, the perfect distance that could allow water to pool on the surface, are ubiquitous in our galaxy. Based on the survey, scientists predict that there should be 1 billion Earth-sized worlds in the Milky Way galaxy at present, a good portion of them presumed to be rocky. That estimate skyrockets when you include the other 100 billion galaxies in the observable universe. This leaves plenty of opportunity for untold more Earth-sized planets in the habitable zone to arise in the future. The last star isn’t expected to burn out until 100 trillion years from now. That’s plenty of time for literally anything to happen on the planet landscape. The researchers say that future Earths are more likely to appear inside giant galaxy clusters and also in dwarf galaxies, which have yet to use up all their gas for building stars and accompanying planetary systems. By contrast, our Milky Way galaxy has used up much more of the gas available for future star formation. A big advantage to our civilization arising early in the evolution of the universe is our being able to use powerful telescopes like Hubble to trace our lineage from the big bang through the early evolution of galaxies. The observational evidence for the big bang and cosmic evolution, encoded in light and other electromagnetic radiation, will be all but erased away 1 trillion years from now due to the runaway expansion of space. Any far-future civilizations that might arise will be largely clueless as to how or if the universe began and evolved. The results appeared in the October 20 Monthly Notices of the Royal Astronomical Society. The Hubble Space Telescope is a project of international cooperation between NASA and the European Space Agency. NASA’s Goddard Space Flight Center in Greenbelt, Maryland, manages the telescope. The Space Telescope Science Institute (STScI) in Baltimore, Maryland, conducts Hubble science operations. STScI is operated for NASA by the Association of Universities for Research in Astronomy, in Washington.